Pierre Chavanges (Swann Arlaud) operates a small, independent dairy farm. He works with a small herd, handling each of his cows with care and dedication. When hemorrhagic fever begins striking farms to the north, he fears it will affect his herd. When one of his cows does fall in, Pierre goes to extreme lengths to protect his cows and keep them from being culled by the government. Hubert Charuel’s directorial debut is a slightly odd, rather small-scale sort of dramatic thriller. At first it seems vaguely ridiculous, as a young farmer grows increasingly paranoid that his beloved herd will succumb to a nightmare disease. Then one of his cows falls sick, and Pierre’s concerns do not quite seem so paranoid any more. It is a very small scale film – it almost entirely takes place on a small farm between Pierre and his overly patient veterinarian sister Pascale (Sara Giraudeau) – but it is impressive how much tension Charuel draws out of his confined and limited premise. It is a hugely promising first feature. Swann Arlaud has an irresistible presence as Pierre. He is moody, quiet and intense. He is very quickly a character with whom it is easy to sympathise, despite his increasingly desperate and ill-advised acts to save his herd. Viewing it from Australia – a country where biosecurity is both widely supported and among the most stringent in the world – some of Pierre’s choices are jaw-droppingly stupid. It leads to a tense viewing experience, caught between wanting Pierre to succeed and also for him to be caught and rightfully prosecuted for putting livestock at risk. Sara Giraudeau makes for a nice balance as Pascale: understanding, but also level-headed and increasingly impatient. It quickly becomes quite a difficult film to watch in places. The first time Pierre kills an infected cow it is almost impossible to tolerate. He loves the cow. He does not want it to suffer and die slowly from the virus. He cannot tell anyone what he is doing – one sign of the virus and the entire herd will be euthanized. He doesn’t have anything with which he can inject the cow, but he does have a shotgun and a sledgehammer. That appalling sense of rising dread is how it should be. Charuel aims for realism and hits the target well. Pierre is a nightmare scenario, and there is no escape. It is immediately obvious from the film’s first act that it cannot have a happy ending; the only question is just dreadful the ending is going to get. The tension is such that everything rapidly sinks into Pierre’s own growing paranoia. 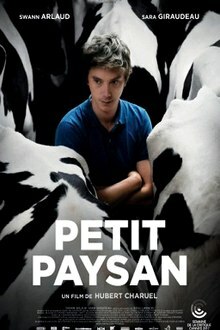 The title is a little unusual, with the international distributor changing it from its French name Petit Paysan (Small Farmer) to the vastly more sensationalist and stomach-churning Bloody Milk. It suggests gore and grand guignol where there is simply growing emotional unease. That’s all enhanced by a fabulous electronic score by musician and producer Myd (Quentin Lepoutre). Who would have expected a small film about a dairy farmer to be so effective, and so tense? Bloody Milk is playing Australia’s Alliance Française French Film Festival. Check here for screening details.